Although Randy Moss asked for a trade from the New England Patriots at the start of the season, fans were still shocked when the Patriots got rid of their star player. Now more information is surfacing about the straw, or hair, that broke the camel’s back. During last week’s Monday Night football game against the Miami Dolphins, Moss had a blowup during half-time. Pats QB Tom Brady confronted Moss about his attitude, and the altercation escalated to about the men’s hair. Brady told Moss to shave his beard, and Moss chirped back for Brady to cut his girly hair. Moss’ new team the Minnesota Vikings will play the NY Jets tomorrow on Monday Night Football. Someone who did want Moss was Minnesota Vikings’ QB Brett Favre. Favre was instrumental in getting Moss to come back to the team that drafted him and where he started his career. The Vikings were a Super Bowl favorite but are 1-2. Part of the reason for Minnesota’s rough start are injuries to their recovers. Pro Bowler Sidney Rice is out for the first 6-weeks with a hip injury, and Percy Harvin is day to day with migraine headaches. 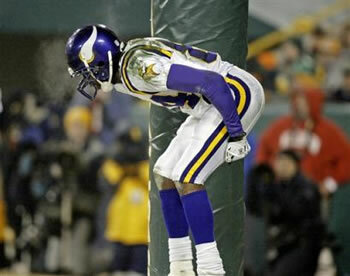 The Vikings play the NY Jets on Monday night, and Moss is expected to be in a purple and gold uniform. Tom Brady’s wife Gisele Bundchen kissing another man? 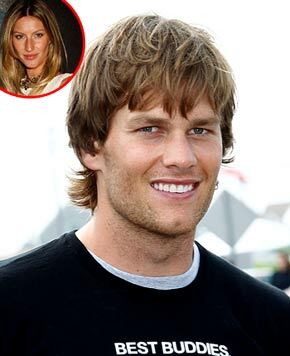 Tom Brady has recently caught a lot of flack after he told reports his super model wife Gisele Bundchen will not let him cut his hair. Not even a 2-time Super Bowl MVP wears the pants in his relationship, and now Bundchen has been snapped in some scandalous photos with another man. TMZ first posted the photos at Bundchen at a masqured ball in Paris. Budchen looks to be kissing the man in question Helly Nahmad. Nahmad is a French art heir and trust fund millionaire. Bundchen and Nahmad are apparently good friends, but I am sure that doesn’t make Brady feel better about the pictures.